The explosion of traffic over data communications networks has resulted in a growing demand for Quality of Service (QoS) techniques to ensure network reliability, particularly in regard to e-commerce applications. Written by two experts in the field, this book covers the implementation of QoS techniques from an engineering point of view. 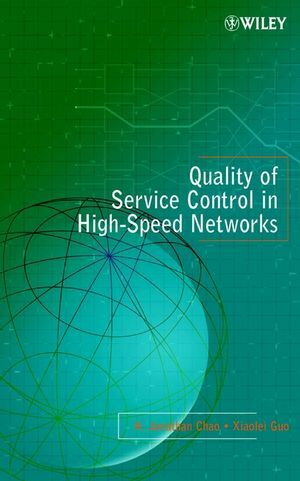 Readers will find practical, up-to-date coverage of all key QoS technologies, real-world engineering examples illustrating theoretical results, and a discussion of new control techniques for the next generation multimedia networks. H. JONATHAN CHAO, PhD, earned his doctorate at The Ohio State University. Since 1992 he has been Professor of Electrical Engineering at Polytechnic University, Brooklyn, New York, and conducts research in terabit ATM switches and IP routers, quality of service control, and photonic packet switching. He was cofounder and Chief Technical Officer of Coree Networks Inc., building a terabit IP/MPLS switch router. Between 1985 and 1992 he was a member of technical staff at Telcordia in New Jersey. He is a Fellow of the IEEE and has published widely in the above subjects. XIAOLEI GUO, PhD, is a senior integrated circuit designer at INTEC Systems in Manalapan, New Jersey, where he works on the development of application specific integrated circuits for broadband communications. Appendix: SONET and ATM Protocols.